The GradientGlowFilter class lets you apply a gradient glow effect to display objects. A gradient glow is a realistic-looking glow with a color gradient that you can control. You can apply a gradient glow around the inner or outer edge of an object or on top of an object. You can apply the filter to any display object (objects that inherit from the DisplayObject class), such as MovieClip, SimpleButton, TextField, and Video objects, as well as to BitmapData objects. To apply filters to display objects, use the filters property. Setting the filters property of an object does not modify the object, and you can remove the filter by clearing the filters property. This filter supports Stage scaling. However, it does not support general scaling, rotation, and skewing; if the object itself is scaled (if scaleX and scaleY are set to a value other than 1.0), the filter effect is not scaled. It is scaled only when the user zooms in on the Stage. A filter is not applied if the resulting image exceeds the maximum dimensions. In AIR 1.5 and Flash Player 10, the maximum is 8,191 pixels in width or height, and the total number of pixels cannot exceed 16,777,215 pixels. (So, if an image is 8,191 pixels wide, it can only be 2,048 pixels high.) In Flash Player 9 and earlier and AIR 1.1 and earlier, the limitation is 2,880 pixels in height and 2,880 pixels in width. For example, if you zoom in on a large movie clip with a filter applied, the filter is turned off if the resulting image exceeds the maximum dimensions. An array of alpha transparency values for the corresponding colors in the colors array. An array of colors that defines a gradient. An array of color distribution ratios for the corresponding colors in the colors array. Initializes the filter with the specified parameters. [override] Returns a copy of this filter object. An array of alpha transparency values for the corresponding colors in the colors array. Valid values for each element in the array are 0 to 1. For example, .25 sets the alpha transparency value to 25%. The alphas property cannot be changed by directly modifying its values. Instead, you must get a reference to alphas, make the change to the reference, and then set alphas to the reference. The colors, alphas, and ratios properties are related. The first element in the colors array corresponds to the first element in the alphas array and in the ratios array, and so on. The angle, in degrees. Valid values are 0 to 360. The default is 45. The angle value represents the angle of the theoretical light source falling on the object and determines the placement of the effect relative to the object. If distance is set to 0, the effect is not offset from the object, and therefore the angle property has no effect. The amount of vertical blur. Valid values are 0 to 255. A blur of 1 or less means that the original image is copied as is. The default value is 4. Values that are a power of 2 (such as 2, 4, 8, 16, and 32) are optimized to render more quickly than other values. An array of colors that defines a gradient. For example, red is 0xFF0000, blue is 0x0000FF, and so on. The colors property cannot be changed by directly modifying its values. Instead, you must get a reference to colors, make the change to the reference, and then set colors to the reference. The offset distance of the glow. The default value is 4. Specifies whether the object has a knockout effect. A knockout effect makes the object's fill transparent and reveals the background color of the document. The value true specifies a knockout effect; the default value is false (no knockout effect). The number of times to apply the filter. The default value is BitmapFilterQuality.LOW, which is equivalent to applying the filter once. The value BitmapFilterQuality.MEDIUM applies the filter twice; the value BitmapFilterQuality.HIGH applies it three times. Filters with lower values are rendered more quickly. For most applications, a quality value of low, medium, or high is sufficient. Although you can use additional numeric values up to 15 to achieve different effects, higher values are rendered more slowly. Instead of increasing the value of quality, you can often get a similar effect, and with faster rendering, by simply increasing the values of the blurX and blurY properties. An array of color distribution ratios for the corresponding colors in the colors array. Valid values are 0 to 255. The ratios property cannot be changed by directly modifying its values. Instead, you must get a reference to ratios, make the change to the reference, and then set ratios to the reference. Think of the gradient glow filter as a glow that emanates from the center of the object (if the distance value is set to 0), with gradients that are stripes of color blending into each other. 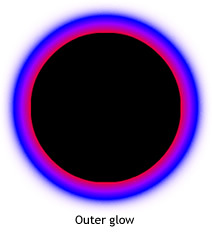 The first color in the colors array is the outermost color of the glow. The last color is the innermost color of the glow. 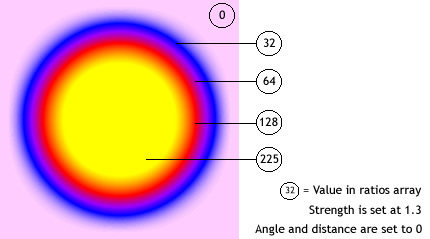 Each value in the ratios array sets the position of the color on the radius of the gradient, where 0 represents the outermost point of the gradient and 255 represents the innermost point of the gradient. The ratio values can range from 0 to 255 pixels, in increasing value; for example [0, 64, 128, 200, 255]. Values from 0 to 128 appear on the outer edges of the glow. 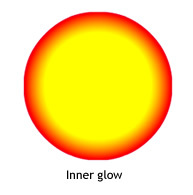 Values from 129 to 255 appear in the inner area of the glow. Depending on the ratio values of the colors and the type value of the filter, the filter colors might be obscured by the object to which the filter is applied. To achieve a seamless effect with your document background when you set the type value to "outer" or "full", set the first color in the array to the same color as the document background, or set the alpha value of the first color to 0; either technique makes the filter blend in with the background. If you make two small changes in the code, the effect of the glow can be very different, even with the same ratios and colors arrays. Set the alpha value of the first color in the array to 0, to make the filter blend in with the document's white background; and set the type property to "outer" or "inner". Observe the results, as shown in the following images. Keep in mind that the spread of the colors in the gradient varies based on the values of the blurX, blurY, strength, and quality properties, as well as the ratios values. The strength of the imprint or spread. The higher the value, the more color is imprinted and the stronger the contrast between the glow and the background. Valid values are 0 to 255. A value of 0 means that the filter is not applied. The default value is 1. BitmapFilterType.INNER — Glow on the inner edge of the object; the default. distance:Number (default = 4.0) — The offset distance of the glow. angle:Number (default = 45) — The angle, in degrees. Valid values are 0 to 360.
colors:Array (default = null) — An array of colors that defines a gradient. For example, red is 0xFF0000, blue is 0x0000FF, and so on. alphas:Array (default = null) — An array of alpha transparency values for the corresponding colors in the colors array. Valid values for each element in the array are 0 to 1. For example, a value of .25 sets the alpha transparency value to 25%. ratios:Array (default = null) — An array of color distribution ratios. Valid values are 0 to 255. This value defines the percentage of the width where the color is sampled at 100 percent. blurX:Number (default = 4.0) — The amount of horizontal blur. Valid values are 0 to 255. A blur of 1 or less means that the original image is copied as is. Values that are a power of 2 (such as 2, 4, 8, 16 and 32) are optimized to render more quickly than other values. blurY:Number (default = 4.0) — The amount of vertical blur. Valid values are 0 to 255. A blur of 1 or less means that the original image is copied as is. Values that are a power of 2 (such as 2, 4, 8, 16 and 32) are optimized to render more quickly than other values. strength:Number (default = 1) — The strength of the imprint or spread. The higher the value, the more color is imprinted and the stronger the contrast between the glow and the background. Valid values are 0 to 255. The larger the value, the stronger the imprint. A value of 0 means the filter is not applied. knockout:Boolean (default = false) — Specifies whether the object has a knockout effect. A knockout effect makes the object's fill transparent and reveals the background color of the document. The value true specifies a knockout effect; the default is false (no knockout effect). BitmapFilter — A new GradientGlowFilter instance with all the same properties as the original GradientGlowFilter instance. Declare global variables used to define the square and filter. Calls the draw() method, which uses methods of the Graphics class accessed through the graphics property of Sprite to draw a square. Creates a BitmapFilter object named filter and assigns it the return value of a call to getBitmapFilter(), which creates the filter. Creates a new array named myFilters and adds filter to it. Assigns myFilters to the filters property of the GradientGlowFilterExample object. This applies all filters found in myFilters, which in this case is only filter.